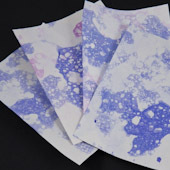 Use paint and bubble blowing liquid to make this kid-safe alternative to marbled paper. 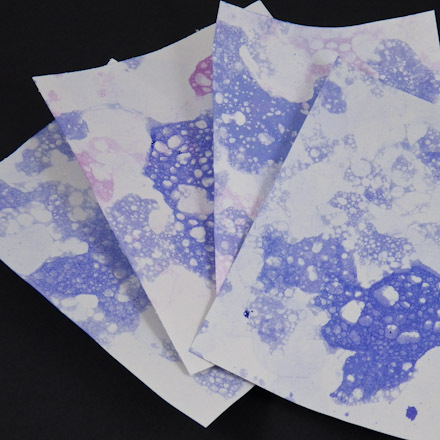 With this technique, you will make pastel prints of soap bubbles on paper that can then be used for other craft projects. 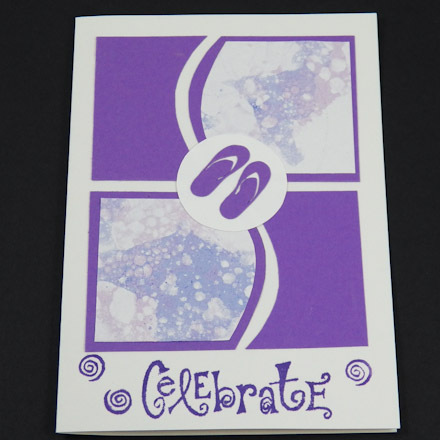 It's fun to create greeting cards with cutouts of this paper made using stencils as patterns. 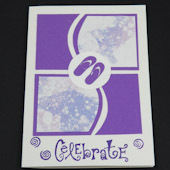 Glue the shapes on folded cardstock to make greeting cards or stationery. If it's an animal shape, you might draw on eyes or other features using a black marker. This craft is well-suited for family, group or classroom craft time, and requires little preparation by the adult or teen leader. Gather the materials needed for making the bubble print paper. Cut the construction paper in quarters: approximately 4½" by 6". Lay out the newspapers to cover your work area. Pour 1 cup (250 ml) bubble liquid into the pan to a depth of approximately ¼" to ½" (6 to 12 mm). Stir in 1 tablespoon (15 ml) of paint. Increase volumes proportionately for larger pans. Tip: Make bubble solution by following Aunt Annie's recipe for Homemade Bubble Solution; the glycerin may be omitted. Or, add 1 tablespoon dish liquid to 1 cup water to make a bubble solution. Insert the end of the straw into the liquid and blow very gently to make bubbles covering the surface of the liquid and higher than the pan's rim. Or, you can stir the liquid with the spoon to make smaller bubbles. It works best to stir the solution and blow fresh bubbles before each print is made. Holding a piece of paper by the edges, lay it down on the surface of the bubbles, pressing down slightly to pop some of the bubbles. Don't let go of the paper or let it touch the liquid. Tip: Make two-color paper by overprinting with a second color after the first color is mostly dry. Lay the paper face-up to dry. The paper may curl as it dries, so you might want to flatten it under some heavy books before using it. Use the paper in any craft you like. It makes pretty Four Patch Cards and nifty Artwork Bookmarks. Tip: If you don't like how the paper turned out, you can print the paper over again one or more times, or use a different color of paint. That's it! How will you use your bubble print paper? Thanks to Virginia Peterson for sharing this craft idea with Aunt Annie's Craft Exchange in 1996. Tip: Cut up your bubble print paper to make Artwork Bookmarks. 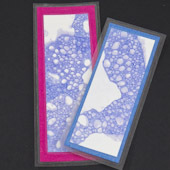 Tip: Use the Bubble Print Paper to make invitations and cards. This card design comes from the Four Patch Cards tutorial.